Freight trucks are used to carry goods such as dry bulk, oil and gas, postal, chemicals and others from one place to another. A proper functioning in the freight transportation system is an important element in a successful economy. Rising volume of transportation of goods over the years is triggering the growth rate of freight trucking market. Growing urbanization and rise in trade volume has resulted in increase in transport volumes. The speedy growth in the internet retailing market across the globe is driving the growth of the freight trucking market. Rising popularity of online shopping over the years is acting as one of the major drivers of the freight trucking market across the globe. Increase in online shopping is mainly due to rising access to the internet facilities among the consumers. Rise in convenience and easy access related to home delivery services are supporting the market currently. Additionally, technological advancements is helping the growth of the freight trucking market. Asia Pacific dominated the global freight trucking market in 2016 owing to the rising industrialization and population over the years. The global freight trucking market has been segmented on the basis of type, size, end user, distance and cargo type. By different truck type the global freight trucking market has been segmented into lorry tank, truck trailer, refrigerated truck and flatbed truck and others. Refrigerated truck showed the fastest growth rate during the forecast period owing to the rising volume of transport of perishable commodities over the years. On the basis of size the global market has been segmented into heavy trucks, medium trucks, light trucks and others. By distance the market has been segmented into less than fifty miles, fifty one to hundred miles, hundred one to two hundred miles, two hundred miles to five hundred miles and above five hundred miles. On the basis of cargo type, the market has been segmented into dry bulk goods, oil and diesel, postal and others. The market has been further segmented on the basis of end user such as oil and gas, industrial and manufacturing, energy and mining, chemicals, pharmaceutical and healthcare and food and beverages. On the basis of geography the global freight trucking market has been segmented into North America, Europe, Asia Pacific, Middle East and Africa and South America. 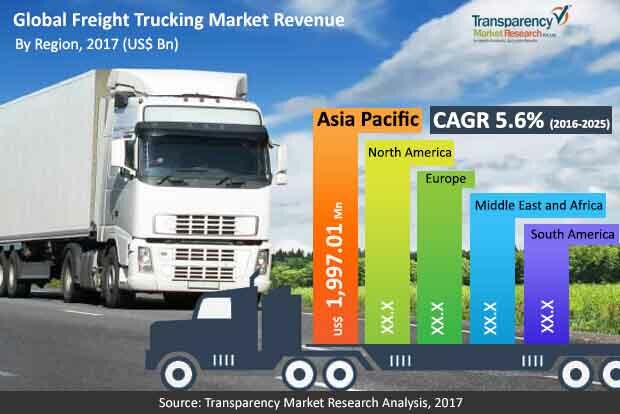 The revenue of the global Freight Trucking market was estimated at US$ 3,844.76 billion in 2016 which is projected to expand at a CAGR 5.6% percent during the forecast period (2017 to 2025) and is expected to reach US$ 6,252.81 billion by 2025. Asia Pacific region which comprises of China, India, and Japan was the largest revenue contributor to the global freight trucking market in 2016. North America accounted for the second largest market share in the global Freight Trucking market in the same year. The freight trucking market consists of a large number of public and private players. The freight trucking market industry players focus to develop new products to satisfy the changing consumer preferences. Rise in advancements in technology, and strategic acquisitions are the key competitive strategies adopted by the top players in the Freight Trucking market. Cargo Carriers (Johannesburg, Gauteng), United Parcel Service Inc. (Georgia, United States), FedEx Corporation (Tennessee, United States), Ceva Holdings LLC, (London, United Kingdom), Tuma Transport (Johannesburg, South Africa), Swift Transportation (Harare, Zimbabwe), Interlogix Privated Limited (Durban), Kuehne+Nagal Incorporated, (Bremen, Germany), Transtech Logistic (Johannesburg, South Africa), Procet Freight (South Africa),Concargo Private Limited (South Africa), Werner Enterprise (Omaha, Nebraska) among others are the key companies profiled in the research report. The report also offers competitive landscape of the key players in the Freight Trucking market. The Freight Trucking market report provides analysis for the period 2015–2025, where in the period from 2017 to 2025 is the forecast period and 2016 is the base year. The report covers all the major trends and key drivers playing a major role in Freight Trucking market growth over the forecast period. It also highlights the drivers, restraints, and opportunities expected to influence market’s growth during the said period. The study provides a holistic perspective on the Freight Trucking market’s growth throughout the above mentioned forecast period in terms of revenue (in US$ Bn), and volume (in million tons), across different geographies, including Asia Pacific, South America, North America, Europe, and Middle East & Africa (MEA). The market overview section of the report demonstrates the market dynamics and trends that influence the current nature and future status of this market. An attractiveness analysis has also been provided for every geographic region in the report, in order to give a thorough analysis of the overall competitive scenario of the Freight Trucking market. Moreover, the report provides an overview of the various strategies adopted by key players of Freight Trucking present in the market. Product definition and introduction chapter helps in understanding different types of Freight Trucking used across all the regions. The global freight trucking market has been segmented on the basis of type, size, end user, distance and cargo type. By truck type, the global freight trucking market has been segmented into lorry tank, truck trailer, refrigerated truck, flatbed truck and others. On the basis of size, the global market has been segmented into heavy trucks, medium trucks, light trucks and others. By distance, the market has been segmented into less than fifty miles, fifty one to hundred miles, hundred one to two hundred miles, and two hundred miles to five hundred miles and above five hundred miles. On the basis of cargo type, the market has been segmented into dry bulk goods, oil and diesel, postal and others. The market has been further segmented on the basis of end user such as oil and gas, industrial and manufacturing, energy and mining, chemicals, pharmaceutical and healthcare and food and beverages. Thus, the report provides in-depth cross-segment analysis of the Freight Trucking market and classifies it into various levels, thereby providing valuable insights at the macro as well as micro levels. Moreover, report also provides in depth study of Size of Freight Trucking market and types of Size. The report also highlights the competitive landscape of the Freight Trucking market, thereby positioning all the major players according to their geographic presence and recent key developments. In competitive landscape report includes in depth study of top players of Freight Trucking market. The comprehensive Freight Trucking market estimates are the result of our in-depth secondary research, primary interviews, and in-house expert panel reviews. On the basis of country, North America market is divided into The U.S., Canada and Rest of North America. Similarly, Europe market is divided into Germany U.K., France, and Rest of Europe. Asia Pacific has been segmented into China, Japan, India and Rest of Asia Pacific. Middle East and Africa covers the G.C.C. countries, South Africa, and Rest of Middle East and Africa. Similarly, South America region includes Brazil and Rest of South America. This report provides all the essential information required to understand the Freight Trucking and its types. Furthermore, Porter’s Five Forces analysis explains the factors which are currently affecting the Freight Trucking market. Cargo Carriers (Johannesburg, Gauteng), United Parcel Service Inc. (Georgia, United States), FedEx Corporation (Tennessee, United States), Ceva Holdings LLC, (London, United Kingdom), Tuma Transport (Johannesburg, South Africa), Swift Transportation (Harare, Zimbabwe), Interlogix Private Limited (Durban), Kuehne+Nagal Incorporated, (Bremen, Germany), Transtech Logistic (Johannesburg, South Africa), Procet Freight (South Africa),Concargo Private Limited (South Africa), Werner Enterprise (Omaha, Nebraska) among others are some of the major players operating within the global Freight Trucking market profiled in this study. Details such as financials, SWOT analysis, business strategies, recent developments, and other such strategic information pertaining to these players have been duly provided as part of company profiling.